Its Saturday and that can only mean one thing, long run! I met the running group at 5:00am this morning for a sixteen mile run. I was a little worried about getting out of my normal Friday night routine because I had family in town for the past few days. I was still able to get to bed at a decent hour and even made everyone a pasta dinner (wholegrain pasta with turkey meatballs). I got up at 4:00am, ate a breakfast bar and drank a glass of water. I filled up my camel pack with ice and water and brought two hammer gels for hydrating and refueling. I was actually not dragging this morning and felt really good as I walked out the door at 4:40am. Our running group met at St. Andrews in the Old Village for a loop around Mount Pleasant. We had eight runners in our group. We even had one runner (Adnan) show up at the last minute to run with us on his twenty seventh birthday! I ran the first warm up mile with the group (13:27 ). After that we broke up into three pace groups. I was running with two other guys (Andrew and Adnan). We ran up Rifle Range Road to the Isle of Palms Connector and around the Town Centre (10:42, 10:39, 10:08, 10:18, 10:32, 10:28). We stayed together until mile seven and Adnan (who had not run long distance in over a month) dropped back. We ran down Mathis Ferry Road (10:17, 10:11)and did an out and back to Remley's Point (9:59,9:55). Coach Greg showed up with water and I was able to refill my camel pack (this was a huge help). 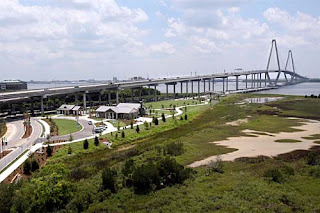 We then ran around the new park under the Cooper River Bridge, this was the first time we had gone this route and it was great (10:04, 9:54). We made our way up Coleman back to the Old Village (9:56, 9:40). At this point we noticed that we were pretty short on our last mile so we ran a cool down mile around a few blocks (10:47). After finishing the run I was spent, but felt great. I drank a lot of water and a bottle of low calorie Gator Aid. I also drank a bottle of chocolate milk (suggested by Steve and Greg). Before I went home I was talking to two other runners (Joy and Tammy) about the route being a little short today. In true crazy form they both decided to go run another mile. I love these people! I went home and took a fifteen minute ice bath. This felt really good (OK, not at first) and took the soreness out of my legs for the rest of the day.